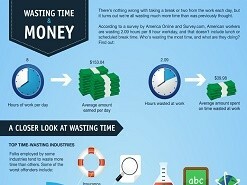 Do you know how much time and money you waste every single day? This infographic may give you the answer to this question and you will learn so many things that you knew nothing about in the past. It is quite problematic when you lose a lot of time since this automatically translates into money. As a really simple example, as you can see right at the beginning of the stats issued, the average US work day is valued at $153.04 dollars but 2.09 hours of that time is actually wasted, leading to a loss of $39.98. While downtime is something that is normal at various jobs, you may want to know exactly how much that time is valued. The infographic is definitely interesting and offers various statistics you will want to know. This does include stats related to the industries that lead the list on how much time is lost. It is not at all a surprise to see that the insurance sector is right on top but it is quite disappointing to see that Education is also really high on the list. One of the interesting facts of interest that you will instantly notice is that employers that are older are actually a lot less likely to lose time when compared with those that are younger. This is surprising, especially given the fact that most employers out there think that they need to hire really young employers while avoiding those that are older. Learn about the excuses that the employers use in order to justify the fact that they do not work and simply go through the entire Wasting Time And Money infographic. It is particularly important for the business managers and for the people that currently work in human resources. However, even employees can learn a lot about how to be cherished more at the end of the day. While it is completely normal to have time wasted at work since you cannot actually work all the time and downtime happens because of various reasons, we are confident in saying that you did not know that this was the case until you actually saw what is highlighted in the infographic. PREVIOUS POST Previous post: Why Should You Consider Visme To Create Your Infographics?